Pyrethrum 5EC is approved for use against a wide range of pests including Spotted Winged Drosophila (SWD), greenfly, whitefly, blackfly, thrips, flea beetle, aphids and caterpillars. For use on all soft fruit, top fruit, vegetable crops, salad crops and ornamentals. For use in indoor and outdoor growing systems, there is no limit on the number of applications in the growing season, Pyrethrum 5EC can be applied throughout the season at seven day intervals. Zero active ingredient residue profile, crops can be harvested 24 hours after application. Pyrethrum is a natural substance purified from chrysanthemum flowers. Chrysanthemum flowers have been available in Europe for over 150 years and in their powdered form were used as louse and flea powders. 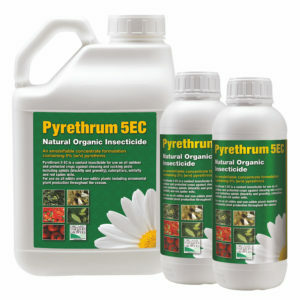 It is only in the last 50 years that liquid concentrates for public health pest control have appeared, and only in the last 10 years that they have been available for use in horticulture with the launch of Pyrethrum 5EC in the UK. Subject to rigorous quality control, Pyrethrum 5EC is formulated as a 5% w/v natural pyrethrum concentrate, synergised with piperonyl butoxide (PBO) from natural oils. The active ingredient causes rapid knockdown of insects followed shortly by death. The mode of action is non-systemic and contact action caused by the binding of pyrethrins to sodium channels inhibits the insect’s nervous system. This mode of action leads to a broad-spectrum of insecticidal activity. Pyrethrum is non-persistent in the environment which allows just a 24 hour withdrawal period prior to harvest and retreatment of crops at seven day intervals. Pyrethrum 5EC should be used at a concentration of 0.02% (20ml product in 5 litres water) and applied at a maximum rate of 275 litres per hectare for outdoor crops, and 600 litres per hectare for crops grown under cover. Natural pyrethrum has not been notified as an insecticide with a high risk of insect resistance. The reason for this is that pyrethrum is a mixture of active ingredients, pyrethrins I and II (harder to develop resistance to). The presence of PBO in the Pyrethrum 5EC inhibits the insects natural resistance mechanism.